Onekahakaha means "drawing [pictures] sand," but the origin of the place name is now unknown. Besides its Hawaiian name, Onekahakaha was commonly called Machida Beach during the first half of the twentieth century. About 1915, Tomozo Machida obtained a longterm lease on approximately 13 acres of the present beach park. The only access to the natural pocket beach was a trail, so Machida put in a dirt road and then built a two-story beach home. The improvements did not go unnoticed in the community, and soon many of the kumiai, the local Japanese social organizations, were requesting use of the premises for annual picnics and other group functions. For a time, the Machida family graciously honored these requests, but after a number of years the burden of maintaining the home and meeting the needs of the kumiai and other groups became too heavy. So, in the early 1930s when the territory asked the family if they would relinquish their lease to make way for a public beach park, the family willingly agreed. The house was torn down, but the family name was preserved in Machida Lane, a small road leading to the homes to the rear of the park's main parking lot. The county eventually developed the property as Onekahakaha Beach Park and installed public facilities. During the summer of 1968 county workers began construction of a children's zoo on a one-acre parcel located at the entrance to Onekahakaha Beach Park. The completed project was opened to the public on February 1, 1969, and Mayor Shunichi Kimura presided over the opening ceremonies. In 1973 the small temporary zoo facility was relocated to a permanent 30-acre site in Panaʻewa, next to the racetrack. Though the zoo is gone, Onekahakaha continues to attract more families with children than any other beach park in the district of Hilo. The park's popularity is due to a combination of features. Besides lifeguard service provided by the county, there are picnic pavilions, restrooms, showers, and ample parking; but the main attraction is the large shallow, sand-bottomed ocean pool protected by a boulder breakwater. This pool offers one of the safest shoreline swimming areas along this coastline during normal weather conditions and is therefore especially attractive to families with young children. Although occasionally in recent years the sand at the park has been artificially replenished because of erosion, Onekahakaha has always been blessed with a natural pocket of white sand. A second large ocean pond, north of the first, is not protected by the breakwater and is therefore much less used. This second pond has a deeper, rockier bottom, which harbors a sizable sea urchin population and is subject to much stronger current and water movement, including a persistent rip current that runs seaward from the end of the breakwater. 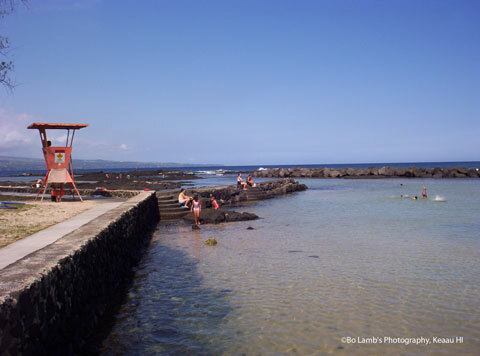 Over the years, particularly before lifeguard service was provided, Onekahakaha has been the site of many drownings and near-drownings. The offshore currents beyond the breakwater are always strong and during of high surf, powerful rip currents can carry swimmers directly into the waves pounding on the rocky shoreline. These conditions have been directly responsible for many fatalities. In spite of the breakwater and a number of retaining walls along the shore, exceptionally high winter surf often floods the park, sweeping through the camping area and into the marsh behind it, discouraging almost all use of the park. Onekahakaha Beach Park also includes an undeveloped section of shoreline between the park and Kedkea Point. Although no park facilities are available, a number of large, sand-bottomed tidal pools and inlets indenting the otherwise rocky coast attract many beachgoers, including picnickers, waders, and fishermen. The area has been variously called Kedkea Point, Lihikai Beach Park, and the Lihikai extension (of Onekahakaha Beach Park). A public right-of-way at the makai end of Lihikai Street provides the most popular access to this area.